On Episode 267 Of the WP-Tonic show Miranda Lievers From Thinkific.com joined Jonathan Denwood and Kim Shivler to discuss providing an Online Learning Management System as a SaaS (Software as a Service) product. Thinkiffic is an online LMS with extensive features including automated courses, affiliate tracking, quizzes and reports for instructors. The company also touts its ease of use. This is a great option for people who don’t want to build and maintain their own platform. Anyone can signup and start creating a class in minutes, and while the free version is missing some of the features of the premium versions, this is a great way to test a class idea. 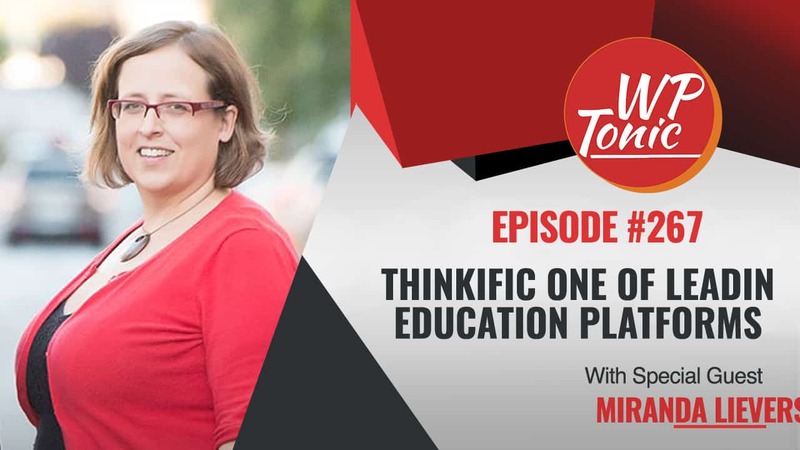 Miranda Lievers is co-founder & COO of Thinkific, a tech company enabling tens of thousands of entrepreneurs and companies to create, market, and sell their own courses online. She jumped ship from her fast-track corporate job and into full-time entrepreneurship a decade ago, earning her MBA along the way. This Episode is Sponsored By…. Jonathan: Welcome back folks to the WP-Tonic Wednesday show. We’ve got a great guest here. We’ve got Miranda Lievers, one of the joint founders of Thinkific. Miranda, would you like to introduce yourself a little bit? Miranda: Thanks so much for having me today Jonathan. I’m thrilled to be here. Yeah. So, as you said, I’m one of the co-founders and I’m COO of Thinkific. Thinkific is an online course platform that allows anybody to create, market and sell their own online courses. But ultimately for me, it’s all about how I can and how we can help small businesses build, scale and grow those companies. So I love talking to entrepreneurs and small business owners who are looking to build their companies online. Jonathan: Oh, thank you so much. And I’ve got my great co-host, Kim would you like to introduce yourself? Kim: Yes. Thank you, Jonathan. I’m Kim Shivler. I’m a Technical Instructor, Instructional Design Consultant and Communications Strategist and co-host of WP-Tonic. Jonathan: Yeah, and a great co-host. And the founder of WP-Tonic. We’re a support maintenance company. We only support WordPress websites with an emphasis on Learning Management Systems and Membership websites. And before we go into the interview, I just want to quickly talk about our show sponsor, which is Kinsta Hosting and Kinsta is just a great WordPress hosting provider. They host the WP-Tonic website. They sponsor the Wednesday shows. We actually host WP-Tonic on Kinsta. And if you’re looking for a quality WordPress partner, for not only your own site but for your client websites, we can’t praise Kinsta much more. And we’ve just found their support and just the company just a delight to work with. So if that’s interesting, go to the WP-Tonic website. There’ll be a link in the show notes and also there’s banner adverts in the sidebars. They are affiliate links so if you use one of those, you’ll be helping the show as well. So that’s great. So, I’m going to hand it over to my co-host to ask the first few questions. Off you go Kim. Kim: Thank you, Jonathan. Miranda, so, let’s everyone know first that, as she said, Thinkific is an online learning platform. A lot of times on this podcast we’re talking to people who are building out their WordPress Learning Management Systems. But you, at Thinkific, you have a little bit different. You are offering people a fully hosted solution. They don’t have to build it out. They just sign up for an account and can focus on, you know, what I do with Instructional Design Consulting, helping people build the best content. As you did that, so, where was it in your mind that you said, “Wow. This is what we need to offer to people to help them build their online courses”. Miranda: Yeah. Great question. I’d love to tell you a little bit about our founding story. So, like many small business owners, we really just started with an entrepreneur with a problem. My co-founder and our CEO Greg, he actually started teaching in person, like LSAT classes, you know, about 10 or 12 years ago in classrooms. And so, he found that every Saturday he was sort of his stuff down there and teaching to the few people that managed to make it out. And inevitably, students would miss class or want more information. And so, his first iteration was actually a blog on WordPress. And so, he actually started putting information online for his students and then basically kind of said, “Wait a minute. Why am I just putting the supplementary information online? What if I could teach even more students by putting my course online?”. So, he built the very first version of his own course. And so, his original goal was just to solve his own problem. And what he found was that all of a sudden what he was hearing more from is other entrepreneurs asking how they too could put their courses online. So, Thinkific was really born from an entrepreneur with a problem, like many of our listeners today and has grown to what we are today. Kim: And what year was that, that Greg, and I have met Greg by the way. Kim: I am one of your customers and I have met with Greg so I’m a bit of a fangirl today. But what year was that, that he was building these courses? Miranda: Yeah. You know, he started, I think he started doing his LSAT in-person stuff like way back in 2003. In the late 2000s, he had started to actually to do his blog and sort of like early early long before Thinkific existed. And then, Thinkific as a company has been around for 6 years. Kim: Excellent. One of the things that I like when I’m talking to hosted companies and as I said, I have taught. I work with people. I’ve put customers into Thinkific. I do work with the platform also as well as we know that I teach WordPress LMS also. But compare Thinkific and the online platform that you have to what a lot of times people think of as the big monster in the room, which is Udemy. Miranda: Oh, sure. I’d love to do that. Yeah. So lots of times people assume that we’re quite similar to Udemy and that actually couldn’t really be further from the truth. So, Udemy is a marketplace. And so, the idea of Udemy is it’s a place where students go to get connected to the learning that they’re looking to find. Instructors can go and they can put their courses on Udemy but ultimately, Udemy is all about connecting students with education. It means that instructors who are putting their course on Udemy are really competing with all the other courses that are on Udemy. So, if you’re putting a Leadership class, for example on Udemy, your competition is all the other Leadership courses and those students are being presented with many different options for their learning. Conversely, with Thinkific is we’re actually a self-hosted platform, which means that we are a platform that helps individual experts and entrepreneurs build their own businesses online to their own audience and their own students. And while we don’t connect you with students, we also don’t force you to compete with all the other instructors. So, the last thing that we want to do is we is we want, what we don’t want to do is take your students and your audience and then start showing them, “Hey. You liked that person’s Leadership course. Why don’t you come over here and buy this person’s Leadership course? Or here’s an even cheaper one”, and that’s not what we’re about at all. We really believe that really great education works really well when coupled with a really effective business model. Because when we have effective businesses and we can grow thriving businesses that actually allows us to invest in creating better and better education. So, for us, it’s way more about that like intersection between create education and create sustainable businesses and helping those businesses grow so that those instructors can build their own audiences rather than our audience. Kim: Nice. Thank you for that clarification. I hear the same with people. They don’t always know, “I’d to just throw one more in there for everybody”, you’re not sure. Part of that self-hosted is you own your content. Kim: Thinkific is not saying, “No. That’s not worthy of us. You can’t put it up”, etcetera. It really is your platform. You’re building on their platform but it is your decision on what your content needs to be. Miranda: Yes. And more so than that, so, we don’t vet the content, we don’t dictate what percentage needs to be video or other types of content and we also don’t say anything about pricing. So you can choose to price your course however you need and however you like and we don’t jump into those kinds of business decisions. Kim: Excellent. And I’m glad you pointed out the pricing. That’s been a big issue with Udemy. Miranda: With Udemy, for sure. Kim: Particularly over the last couple of years where they have started really controlling that pricing. Thank so much. Not so much on a Learning Management platform but you are also a Software as a Service, which we talk a lot about on this show. And you have multiple tiers. You really have a very interesting tier group. I’m now in your $99 a month plan. What was your decision from a business perspective of what fell into those different tiers that people could have? Miranda: Oh my gosh. I wish that I had a really good answer for those because this is something that we’ve actually been talking a lot about recently in terms of what the next iterations of our platform might be and the realization that what we really want to be able to do ultimately is we want to make it really easy for people to start. And especially at those early stages of business, we want to remove as many barriers as possible. So you see that right now in the fact that we do have a free plan. We take a revenue cut but the recognition that like once you start making enough money, we’re going to tell you to move up because it makes more sense at that point for you. We want people to be able to start without any barriers and to get going and to not have to have a big outlay early in the stages of the businesses but we also want to be able to grow with our customers. So, for the most part, you more advanced features moving up in the tiers simply because, like so for example, on our top tier, we have a bunch of features that would require you to pretty much have a Developer on staff before you would need them. Things like SSL and APIs and Webhooks and all these things that a lot of times people don’t even know about early on in their course career. So, for the most part, we try to base it on where we think you might be in your stage of business. We don’t always get it right but we’re always looking to make some improvements there too. Kim: Very nice. I just want to clarify something. I just put somebody into your Free plan within the last 2 weeks. She came to me and that was exactly her need. I said, “This is where you start. You start fast. You can be up and running and you’ll grow. And then, you’ll add things like the affiliate platform”, which you have in your higher plans. Now, when you said SSL though, all of yours are secure whenever we log in. So we’re not going to get those nasty Chrome notices that you’re not secure? Miranda: Yeah. You’re a better product marketer than I am right now. That was my fumble. I was thinking of single sign-on, which is like a Developer feature where if you have like a WordPress site where people already have an account, we can do a single sign-on with that. You are correct entirely. So everything is SSL. Thanks for calling me on that. Kim: You’re welcome. I didn’t want to scare our users to go, “Oh my God. It’s not secure”, because we’ve been preaching to everyone that . . .
Miranda: No. I just, it’s early here. I haven’t had coffee yet. Kim: Jonathan, it sounded like you wanted to jump in. Jonathan: I think we best go for our break folks and we will be back and we’ll be talking some more with Miranda. Be back in a few moments folks. Jonathan: We’re coming back. We’ve been having an interesting discussion. Miranda, people might think, you know, that why WP-Tonic’s talking to you that offers a fully hosted solution. But the reality is different tools for different people at different times of their business development. And we’re all about WP-Tonic providing insights to really quality providers like yourself. But another thing is you’ve been doing this a while, you and your team. Is there any couple of insights that you can give to people that will help them develop a successful online membership course business? Are there any key things that you’ve noticed that you think, you know, if you don’t have those or you do have them, they really help in developing success? Miranda: Good question. Yeah. So, I think that, oh my gosh. So, I think that for me, if you’re talking about somebody who is really just getting started with online, the biggest thing right off the bat is move fast, fail fast and just almost like ripping off the band-aid. So one of the biggest blockers that I see and often when I’m talking to people who are trying to get their course off the ground and they really, like are just really struggling is almost without fail when I talk to them, I discover that it’s that they haven’t actually launched anything and they’re just like in this cycle of where they’re trying to produce the perfect course before they go out to the market and share it with anybody. And that’s like the biggest number one what not to do. Because I think like with anything that we try for the first time, whether it’s like baking a cake or anything at all, the first time you’re going to do something, you’re going to make mistakes. Like maybe trying out a new recipe, it’s not the time to invite company over. But once you do it the first time, that’s when you’re going to make the list of all the things that you now know you should do the second time around and you should have the same mindset with your course. So I encourage people not to build the big giant everything membership site, “I’m going to build out 10 courses and then I’m going to open my doors”, is I very much am an advocate for like, come up with the minicourse, maybe you don’t even charge for it but create a whole course end to end and then market that just to go through all the stages of the process and get used to like, you know, what’s working, what’s not, what would you change the second time around and then you’re way better set up than any other piece of advice I could give you about how to dive into the much larger projects that you’ve got. Miranda: Absolutely. And I’m glad that you actually brought that up because I think that one of the things that we sometimes forget in the online world is that education and teaching, no matter what we’re doing is that we’re still dealing with people. So when we teach in the real world, we’re constantly changing and adjusting what it is that we’re saying, doing based on the feedback from our students. And so, you know as well as I do that if you’re teaching a topic and you’re getting a whole bunch of stares and that’s kind of the prompt to be like, “Okay guys. Where am I? Either I’m like totally below where you guys are or I’ve totally lost you”, but you can adapt. And we’re teaching online, we need to do the same thing but because we don’t have those visual cues of how our students are doing, we need to ask lots of questions, we need to get lots of feedback and then we need to iterate so that we make sure that the content that we’re creating is meeting the needs of our audience. Jonathan: Yeah. The other thing is do you get a lot of people, they think, a bit like a website really is that they build and then they think people will just turn up. Do you get a lot of support requests on that about, “Oh, we’ve set it all up but we’re not getting anybody joining and it’s been over a month. Help”. Do you get a lot of those emails? Miranda: Yeah. I mean, that’s definitely the trap that people fall into once they have created. And so, similarly to just ripping off the band-aid, is I’m also a really big proponent of starting to market really on, even so far as pre-launching and running promotions for courses even while they’re in development. Because that work of marketing and getting in front of your students and new audiences, that’s the business part. That’s the hustling part. That’s what we all need to do as business owners and it’s really important to do that simultaneously to building your content only because it’s not like the fields of dreams. If you build it, they will not come unless they know where it is and where to find it. Jonathan: So, do you provide resources in your own help and support sections? And also, are there any kind of other external resources that come to mind that gives a kind of plan of action around all this? Miranda: Yeah. I’m glad you asked that. Yeah. We’ve got tons of resources. If you hit up our website www.thinkific.com, we’ve got a resources section there that we actually have tons of marketing resources in particular. We’ve actually got a really great, one of our most popular posts is 55 Ways to Market Your Course in 2018. We’ve just updated it for this year. So, we do have a ton of resources for people who are starting on their online course journey as well. We’ve got some really good courses that actually walk you through sort of week by week, step by step. And we’ve actually got, I’ve put together a bundle for your audience here at get.thinkific.com/wptonic, just one word. And we’ve actually got a free month of Thinkific as well as a couple of those courses that I just mentioned because it’s important to get people started off on the right foot with a bit of a guiding path. So we’ve got some education for your audience as well. Jonathan: Oh, that’s great. Thanks for that. Our audience always loves little freebies. They delight them. So, we’re going in the beginning of 2018, where do you see online education courses going in the next 18 months? Do you think it’s at a plateau or do you think there’s still tremendous growth in this whole industry and area? Miranda: Oh, I’m lucky to have the background stats to know that it is going nowhere but up, which is kind of fun for us because we beat records every single week. It’s like the new highest record for the number of new customers that we’ve got. But we know that online courses definitely are not going away. 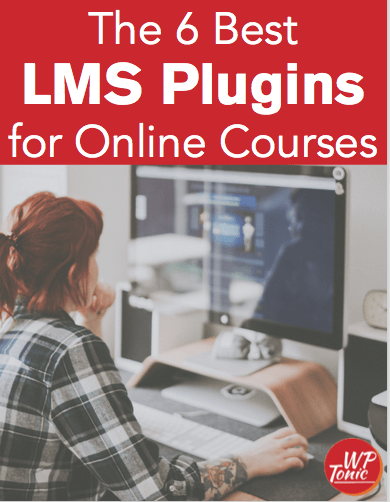 One of the things that we’re starting to really see is that businesses who are not in an online course primary business are actually now starting to add online courses because I think that in many cases, online courses are becoming table stakes. So, anybody that remembers, I’ve been blogging on WordPress for I think as long as WordPress has existed. But anybody who remembers way back, you know, over 10 years ago, there was a shift where blogging started to become table stakes for business. So, all of a sudden, especially if you were in a creative industry like photography or coaches, there became a point where all of a sudden instead of blogging being something nice and new that you needed to do for your business, it became like if you’re not doing this, you’re way behind the boat and the same thing I’m seeing is happening with online courses. So what we’re seeing now is that people are creating online courses to teach their audience about their other products and services. SaaS companies are using online courses to do customer education. We’re even seeing things like Yoga studios, in-person Yoga studios who are creating supplementary online courses so that their students can continue to get value throughout the week. So we’re starting to see online courses become much more sort of mainstream as opposed to just like an online course primary business, which is often about people who are sort of creating a new course to begin with. Jonathan: So you’re really seeing people are utilizing online courses as a differential to their own business to their competitors really. Miranda: Yeah. And especially because I think that, there’s sort of a global shift I feel happening to almost to moving back to personal and back to personal relationships and personal help and support and the recognition that, especially when we have companies, we can’t always have that one to one support and help and resources for our clients the way that we would love to but online courses are actually one of the really great ways that we can scale personal connectivity. So as, again, back to that Yoga instructor example is, you know, “I’ve got my class and people can come down in-person to my class but I want to maintain those relationships and continue to grow that audience and continue to nurture and provide content for my audience. And this is one of those ways that I can start to scale a personal feeling connectivity with my customers”. Jonathan: Oh, that’s great. I think we’re going to wrap it up for the podcast part of the show folks. But Miranda’s agreed to stay on and answer some more questions which you’ll be able to see and listen to on the WP-Tonic website with a full transcription of our interview with Miranda. How can people get a hold of you and find out more about your product, the services, everything? Miranda: Yeah. Like I said, so thinkific.com or you guys can go grab that free month if you just want to dive in and check out those free resources. And that’s at get.thinkific.com/wptonic. Jonathan: That’s great. And Kim, how can people find out more about you? Kim: You can get all the information about me at kimshivler.com and you can find me on Twitter @kimshivler.